SPC for statistician delight only. Assuming that machining technology becomes more and more complex, the benefits of equivalent improvement of control techniques will be significant. However, few outdated methodologies are still in service and continue to consume valuable resources. It is not an exception when someone with zero experience in machining teaches operators how to control their processes using generic SPC. That someone has no clue how to recognize and control non-random, unidirectional, non-repeatable, and non-linear processes. Ironically, we did not find a single machine shop which is using statistical validation of control limits. Why? Because smart operators know that machining processes are not running in a state of statistical control. In order to avoid the fallacious SPC methodology, machine shops are using Pre-control charts. In essence, Pre-Control is fake SPC suitable only for control of open-tolerance characteristics. This method is based on arbitrary, not statistically validated control limits for individuals. It does not have any means to control important output parameters such as sample and process variation. The claimed benefits of this method do not match actual results, especially for a relatively large amount of close-tolerance characteristics . The evolutionary twist to the SPC story would be a complete rejection of the Shewhart model which is really set up to fail for machining and grinding applications . The flip side of it would be the emergence of MICRONITE predictive models for both high-volume and small-batch production. 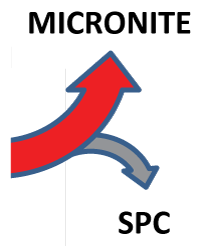 “ I wanted to provide you an update with our process improvement with Micronite. It has taken awhile to understand how to use Micronite appropriately but now seems to value it’s ability to substantially improve quality and increase throughput. I included a weekly report for our product. As you can see, all dimensions are in control based on the patterns and MICRONITE decisions. Also, process events such as tool change, casting change, and offsets are being inputted. The group that reviews this information weekly seems to appreciate being able to see these events noted right next to the respective subgroups and providing them with the information explaining when a process shifts, or spreads etc. It is a much better process control and visualization than QC Calc SPC which we used before on the Wormshaft side”. – Chuck Bartels, Quality control and CI Manager, Haldex Corp.
– Mitch Willard, Setup Operator. Minnesota Medical. One of the most devastating concepts for process control that companies embrace, is the SPC methodology with its irrelevance to the mechanisms of machining processes and inability to estimate the risk of quality acceptance errors. Mostly, the goal is “Get data to customer, no matter how beneficial it is for operators and engineers.” Eventually, machine shops waste time and money on uneventful data plotting that is not worth their efforts. On the other hand, inspection sheets are often lead to concealment and obscurity of data quality. It is easy to learn how to sabotage the quality system by refusing to record unpleasant results. 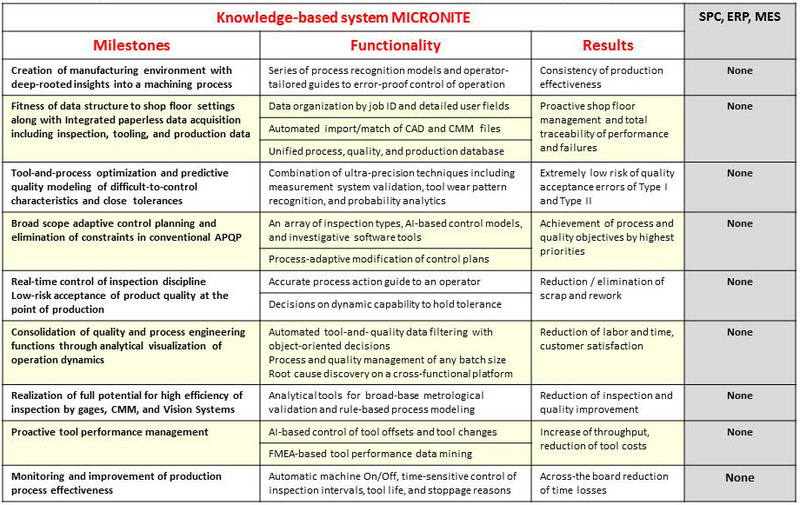 MICRONITE development spans over 25 years in various fileds of process control, artificial intelligence, applied statistics, metrology, quality management & industry-specific software design. E-books by Stephen P. Birman, Ph.D.